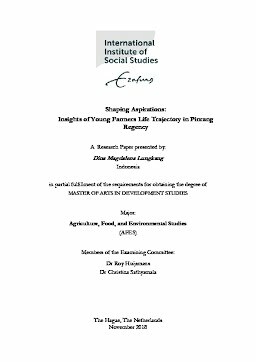 This research paper is about examining the aspirations of young people who became farmers in particular area – Pinrang regency in South Sulawesi, Indonesia. Through conducting semi-structure interview with life history approach combined with participant observations, this research abled to generate the life trajectory of six respondents from different background, age and gender. By looking at life trajectory of six respondents, where the three amongst them are member of a farmers’ community, this research found out that inter-generational contract do contribute on negotiating young farmers’ aspiration, all the more where the family institution appear to be the sole source of welfare for young people. While on the other hand, intra-generational dimension through the locus of a farmers community namely KTSS, helps to enhance their aspirations wherein farming still be taken into account on their future endeavour.